One of the principal causes for death in the United States of America, even before cancer, is a heart attack. In 2008, heart disease caused 25% of all deaths, or 1 in every 4 people died due to this problem. The most common problem, when it comes to heart disease, is coronary heart disease. This is usual for both sexes and can be found in men more than in women. Actually, 785, 000 Americans experience a heart attack for the first time in a year. Also, 470,000 of them had already had one or more heart attacks. The Center for Disease Control and Prevention claims that high cholesterol, smoking, and hypertension are the main reasons for heart attacks. Also, being overweight, leading a sedentary lifestyle, an unhealthy diet, too much alcohol and diabetes can contribute to a heart attack. The most important thing for surviving a heart attack is early detection of the symptoms. Actually, half of the heart attacks happen outside a hospital, this is why you need to be able to recognize the symptoms. The Center for Disease Control and Prevention showed that 92% of their patients felt some kind of discomfort in their chest, but only 27% of them realized that this was a symptom of a heart attack and called 911. If your heart is struggling to pump the blood, it might cause the blood to swell. This will in turn result in bloating of the legs, ankles and feet. Also, you might experience a blue tinge in the extremities or in the lips. This is also known as cyanosis. Due to the fact that the lungs and the heart work together, if the heart’s function deteriorates, the lungs will not receive the oxygen they need. This will in turn cause shortness of breath and difficulty breathing. If the work of the heart is in any way compromised then the blood circulation will reduce and this will lead to lack of oxygen in the blood. This might result in dizziness, if so, you need to immediately consult a doctor. If you have a cough, and it does not seem to go away, it might mean heart failure. This can happen when there is too much blood in the lungs, due to the heart’s inability to give enough blood to the body. If there is whitish or pinkish mucus, it might mean blood leakage. When the arteries close up, the heart begins to work more and this way simple tasks can prove to be difficult and exhausting. Also, you might sleep longer than usual and you might need to take several naps during the day. Discomfort in the chest means pinching, pressure or a burning sensation. This is actually the most common symptom and it might happen during a physical activity or when you are resting. If you feel some discomfort in the chest, you should immediately consult a doctor. Nevertheless, it is very common for women to experience a heart attack without chest discomfort. 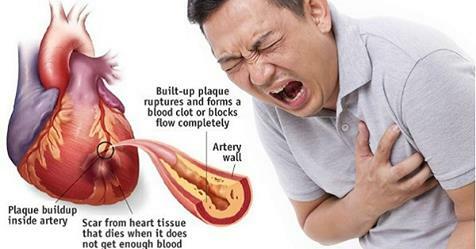 These are the main symptoms that a person might experience before having a heart attack, even a month prior. Thus, try to notice things and listen to what your body is telling you, it might save your life after all.